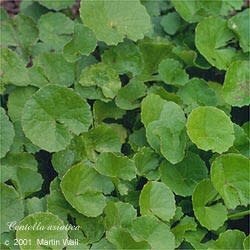 The origin of the genus name Centella is uncertain; it may derive from the Greek kentron, "sharp point." The former genus name Hydrocotyle derives from two Greek words, hydro, "water," and kotyle, "plant." The species name asiatica denotes that the plant is native to Asia. The leaves resemble Chinese coins, hence the folk name pennywort. Gotu kola is native to eastern Asia, Australia, and the South Pacific. It is a spreading, low-growing annual that thrives in swampy conditions such as marches and riverbanks. Its flexible stalks run close to the ground. The leaves are bright green, kidney shaped or round, and alternate. The white or pinkish flowers grow from the leaf axils in umbellate florescences. In Asia gotu kola has long been considered to be a longevity tonic. An old Singhalese proverb says of gotu kola, "Two leaves a day will keep old age away." And there are reports of a Chinese herbalist, Li Ching Yun, who supposedly lived to be 256 years old and was a regular consumer of gotu kola. Gotu kola is known to strengthen the body's membranes, help restore strength to the venous walls and connective tissue, calm the mind, improve neural transport, and help the body detoxify. It is believed to improve the movement of energy from the left and right brain hemispheres. It is used to treat age spots, AIDS, amnesia, appetite loss, asthma, attention deficit disorder, boils, cellulite, cirrhosis, convulsions, depression, dermatitis, drug addiction, eczema, encephalitis, epilepsy, fatigue, fever, hair loss, hay fever, hemorrhoids, hepatitis, insanity, jaundice, keloid scars, leprosy, lupus, malaria, memory loss, mental confusion, mental retardation, nervous breakdown, neuralgia, neurosis, phlebitis, poisoning, premature aging, scleroderma, schizophrenia, scrofula, senility, sinusitis, syphilis, tuberculosis, tumors, varicose veins, venereal disease, vision weakness, and wound healing. It is also used to encourage convalescence after surgery or accident. Both when taken internally and when applied topically in the form of an oil or salve, gotu kola can help stimulate collagen production, improve cutaneous microcirculation, and stimulate cellular mitosis. It can prevent scar formation and improve wound healing time and is used in the treatment of burns, eczema, gangrene, hemorrhoids, leprosy, lupus, and psoriasis. It also can encourage the healing of skin grafts. The fresh leaves can be eaten raw or cooked. In Asia you can find a variety of gotu-kola-based sodas. Gotu kola is often taken as a brain tonic. On the first day of spring in Nepal, for example, gotu kola leaves are given to schoolchildren to improve their concentration and memory skills. The herb is sometimes used in cosmetics for its regenerative and skinfirming properties. Large doses can cause headache, itching, stupor, and vertigo. Avoid during pregnancy, except under the guidance of a qualified health-care practitioner. Avoid in cases of overactive thyroid.